Dya know what? 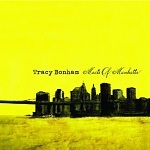 I was bored shitless for the first few songs on this 5th album by Grammy-nominated Tracy Bonham and I kind of wondered how she got those honours. I finally realised by track 5, When You Laugh The Whole World Laughs With You, that Bonham probably deserved her earlier accolades but by the last song I am still scratching my head. After listening to this album six times over, I have come to the conclusion that songs are the main provider of kudos and cash and Bonham falls short on a few occasions. I feel guilty about my opinion during the closing track, I Love You Today, because it ends the album on a high but the first four songs fail to grab my attention beyond yawning and switching on Oprah. Hmmm. Promise swamped by disappointing delivery.